I carried on with a few ideas of what to do with the ragdoll version of my Evolver avatar and I ended up with this interesting behaviour. Which is sort of where I was heading. It is a form of emergent behaviour caused but the avatar being suspended by the two top spheres using a form of hinge. This combined with gravity and the bones and joints in the avatar lead it to create this dancing toy effect that is different each time it is run. 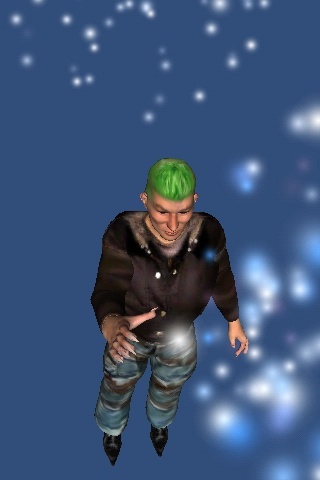 Next is to wire the strings up to touch controls and then I have a full dancing avatar to play with on the iphone. 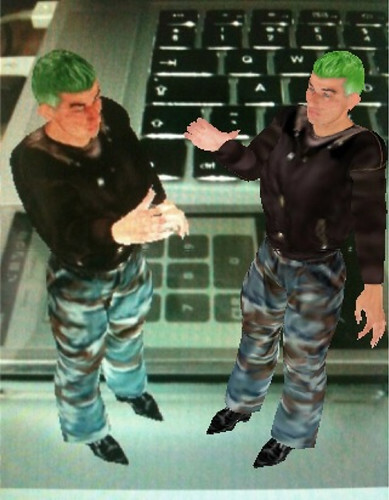 In my continued look at the quick things that can be done with a Mac, and Iphone, unity3d and some content (in this case my Evolver avatar) I thought I would see if the bones and animation worked ok and performed ok on the Iphone. I was not being overly precise about defining the mappings of the ragdoll, but I did click on a few Kinematic check boxes to see what would happen. This was the result. It does indeed animate itself, there is nothing I have put in other than asking for joints and physics it just dances away to itself. It is amazing, the lengths we used to have to go to to make even the most basic animation happen, morphing 2d shapes on commodore 64’s and alike. It feels to me that we have the potential for a huge bedroom coding movement now again. This was so quick to build and deploy that its hard to see why we all are not doing it. 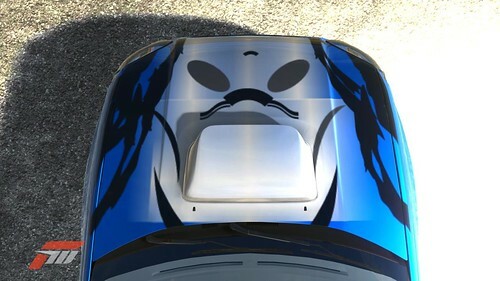 Further to my previous post with some Feeding Edge logos splattered over a Subaru, I just used what little graphic design talent I have to create this multi layered rendition of a predator mask. 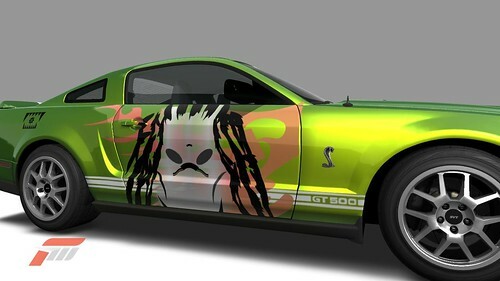 So I now have both a version of the corporate presence and my own merged together on a GT500. 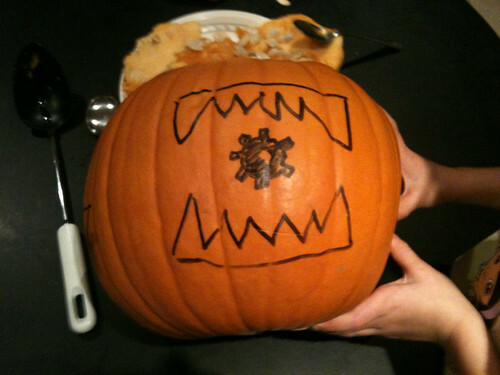 I think it looks pretty good, but then beauty is in the eye of the beholder. 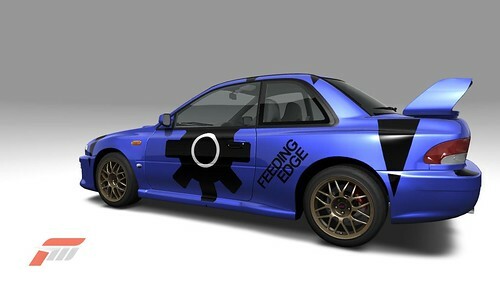 Ok so it will not win any prizes for design (yet) but here is my custom Scooby in superb Forza 3. 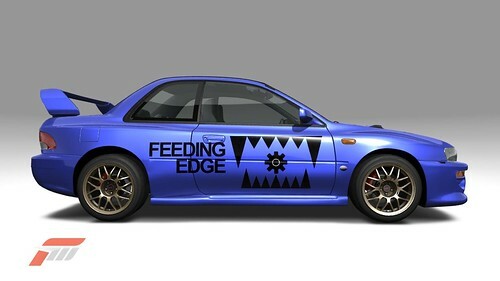 This user created content means that people I race with online with this car get a Feeding Edge advert for free. How are you promoting your brand across social networks like Xbox Live? 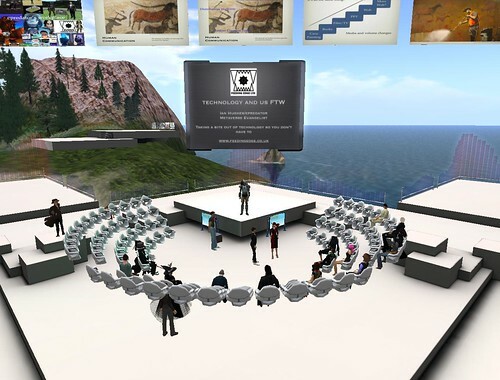 On tuesday night I was invited to pop along in Second Life to a Smarter Technology (sponsored by IBM ironically). Jon and Rissa kindly asked me to show and tell on the various elements of presenting in Second Life that I stumbled upon when preparing for the conference in Derry earlier in the year. I basically had a pop at all the single screen powerpoints that we end up doing in world, just replicating what we do in offices. 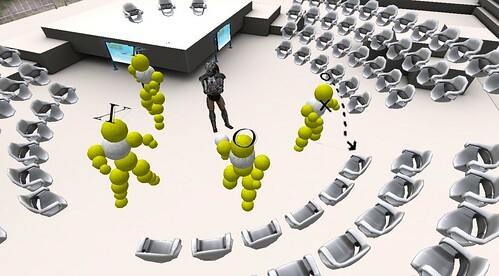 The space and dynamic nature of virtual worlds means we can do so much more. Part of what I do is wear the presentation elements, this is of course a hack around not being able to rez, but it works and has some nice side effects. I used most of the flavours of the pitch that I wrote about here and yes we did get onto 3d printing. So whilst the presentation was about presentation styles I also tried to inject elements of the content in aswell so it was not overly meta. I had also built some examples of the quest for 2d whiteboarding (which we still need) but how that can be done in a different way in these environments, we have dynamic creation, we have 3d immersion why stick to 2d? Still the favourite was the giant hands though I think. I know right at the end we descended into Mac/Iphone/Xbox/Windows 7 discussions but its kind of like the parrot sketch for Monty Python its part of a gathering to discuss such things. IQ and Hursley are still there in world, there are a few plots left to rent on Hursley and the half a sim on IQ is also available though it has a furrie colony borrowing it at the moment let me know if you need some SL space. 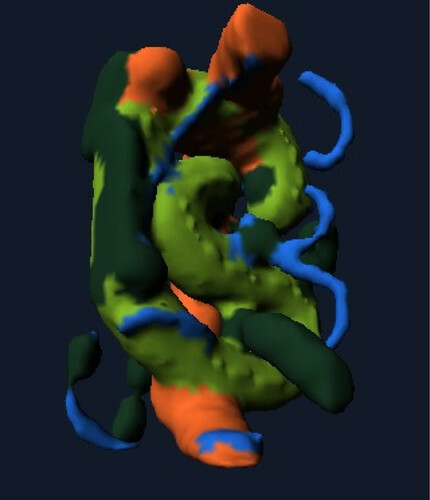 I just bumped into the excellent iphone application called Sculptmaster 3d by Volutopia it lets you build and manipulate a 3d model using touch and some simple tools. You can then take that model and export it as an OBJ file via email or just snapshot it. It produces very organic results, it feels like modelling with clay in many respects. The key for me is that is is using a different interface, in this case the iphone. This makes it very accessible and available to people who want to just have a quick go. Given what I was up to yesterday I had to try and export it and upload it to 3dvia, which of course works fine. Once it is there in 3dvia it is shareable via the 3dvia mobile app, just search for handmade by touch as the model name. 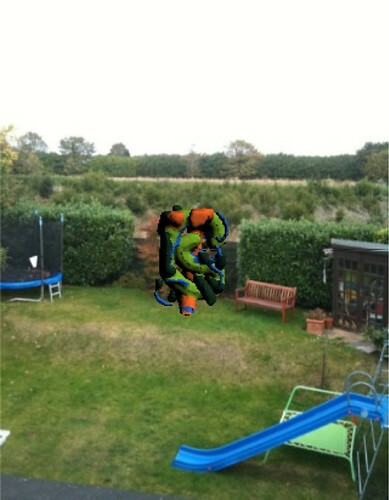 Again I know this is not live augmented reality but I added the sculpture to my garden. That geotagged photo is then actually appearing in the live Flickr Layer in Layar so its another wheel within a wheel. This is interoperability. Data and presence of that data is able to flow, people allowing import and export of user generated content, either live, or in more old fashioned batch means that we can combine applications and try ideas out instantly. This sculpture could of course now be manufactured and created on a 3d printer, the data pattern could be sold, licenced adapted, dropped into other virtual environments. The loop is complete. Whilst having a god with the 3dvia iphone application I decided to see if I could use my Evolver model and upload it to 3dVia, and get myself composited into the real world. The answer is of course you can its just a 3ds model! However I then wondered what would start to happen if we started to augment augmented reality, even in the light sense. I had done some of this with the ARTag markers way back on eightbar. and also here putting the markers into the virtual world and then viewing the virtual world through the magic window of AR. That of course was a lot of messing about. This however, was simple, handheld and took only a few seconds to augment the augmentation. 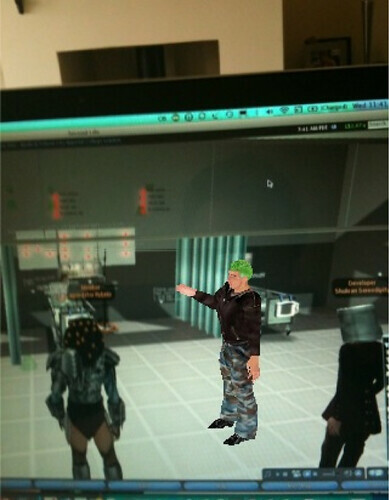 Or augment my view of Second Life. So these are the sort of live 3d models we are likely to be able to move in realtime with the 3d elements in Layar very soon. Likewise we should be able to use our existing virtual worlds, as much as the physical world to define points of interest. I would like to see (and I am working on this a bit) an AR app that lets me see proxies of opensim objects in relative positions projected in an AR iphone app that lets be tag up a place or a mirror world building with virtual objects. 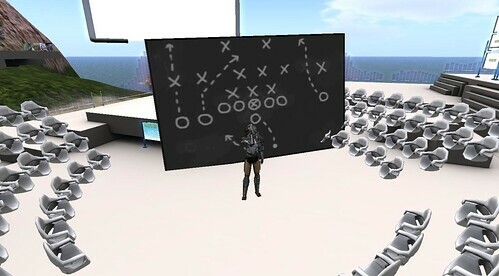 Likewise I want to be able to move the AR objects from my physical view and update their positions in opensim. I am thinking that between things like the Second Life media API’s or direct Opensim elements knowing what is going on in the world, with a combination of sharing services for models like 3Dvia, and wizards like Evolver all jammed into smartphones like the iphone we have a great opportunity.